In talking with Bruce Young (editor of YBM), he expressed the need for article submissions to the magazine. He has been running short of material lately. If you have any short stories, technical write ups or Y related material, this would be a good time to put those in print and send them to Bruce. Doesn’t have to be fancy and even half page write ups would be welcome. Some of you may be aspiring writers and not even know it so here's your chance to give it a try. Here’s an address in which to send those articles to the YBM. If you'd like those articles to be proof read before submitting them, just let me know and I'll give you a hand with that. My contact info is at www.eatonbalancing.com . Ted Eaton. I’ll add that you do not need to be a subscriber to the YBM to submit articles to the magazine. If Bruce does use your article or articles, he sends several complementary copies of that magazine to the author. Ted, have you heard anything about why Jerry Christenson has not been submitting anything? I emailed Bruce about this, and got a sort of non-committal answer. I wondered if Jerry was having health problems or something. I always enjoyed his articles. John - "The Hoosier Hurricane"
I saw Jerry around Christmas and all was well then. He built my engine that I installed last summer. The journey was pretty interesting and I suggested he write about it, maybe I will try my hand at writing if he doesn’t. Thanks Mike, glad to hear all is well with him. I do miss his articles. I haven't talked to him for more than a year. My fault. I should call him. Does Y-Block Mag pay for articles? I've written for some of the leading car mags (But not in the last 10 years) and would like to get back into writing now that I'm retired and have the time. When I first started writing in the late 1970s my editor told me "If you start giving your writing away you have established it value" I would love to write about y-blocks but not for free. 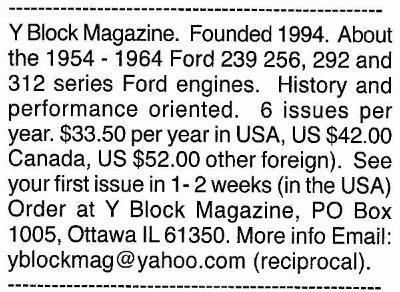 What would be nice (IMO) is that if the magazine is coming to an end that the information be transferred (as per FORD CATALOGING) to disc so all of that info/knowledge is not lost. i wonder how much longer bruce will keep the magazine going.has he ever said anything. If you are a subscriber, you get that yellow slip showing the expired subscriptions. From those you can get a pretty accurate estimate of total subscribers. Multiply that by the subscription fee and you can see that it plainly is not a big operation with a big budget to pay writers and Bruce is also not getting rich off of it. If you ave something to say, Lou, please consider writing for it. If you are retired, then money should not be the motivator it once was and any risk of devaluing your skill is far diminished. That is not to say that you should not aspire to make money in retirement but motivations should be reevaluated.